Acer is expanding its successful business-oriented TravelMate lineup with a sleek new offering – the TravelMate X349. It’s supposed to come out on the market this fall with an absurdly low starting price of around $649, although the model we’ve acquired sports a Core i7-6500U chip, thus considerably more expensive. 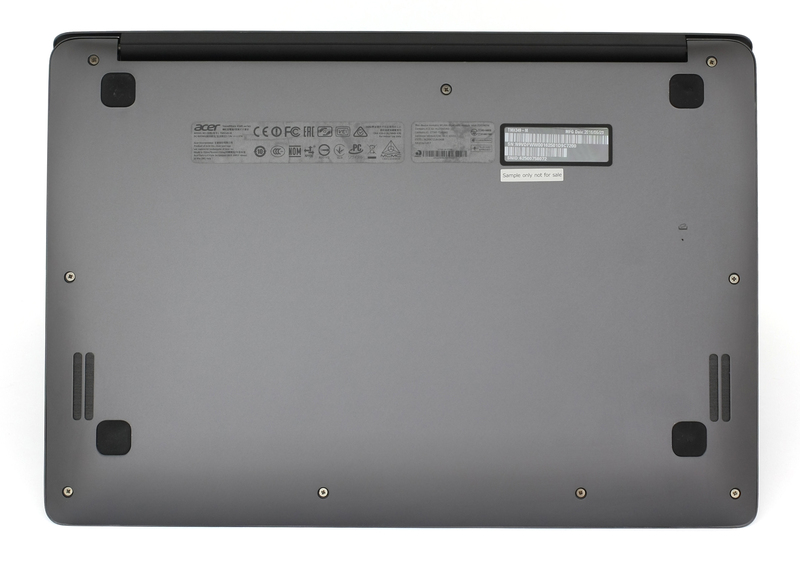 Still, the new TravelMate X349 can easily go against other more expensive 14-inchers like the Lenovo ThinkPad X1 Yoga. 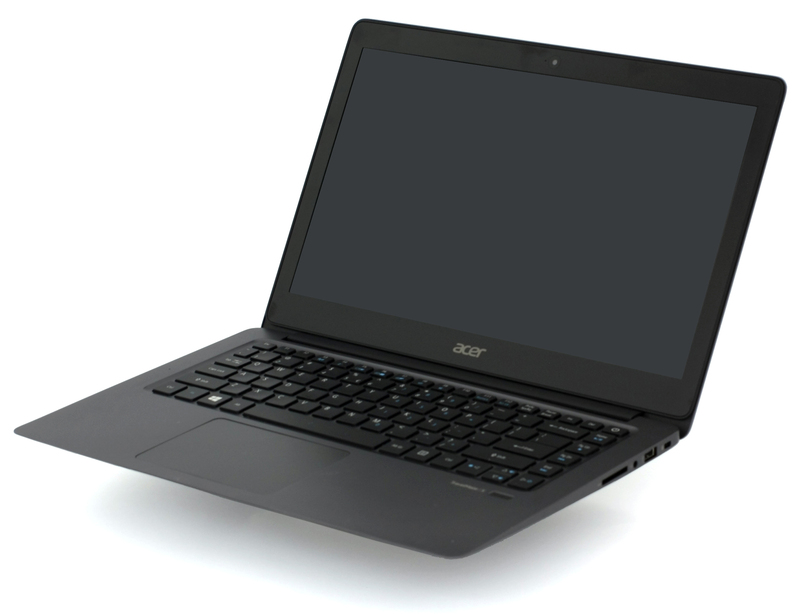 But, of course, you won’t get the 360-degree rotatable hinge with Acer’s solution. Anyway, the TravelMate X349 surprises with excellent price/performance ratio, good IPS panel and exceptional build quality complimented with an all-aluminum design. 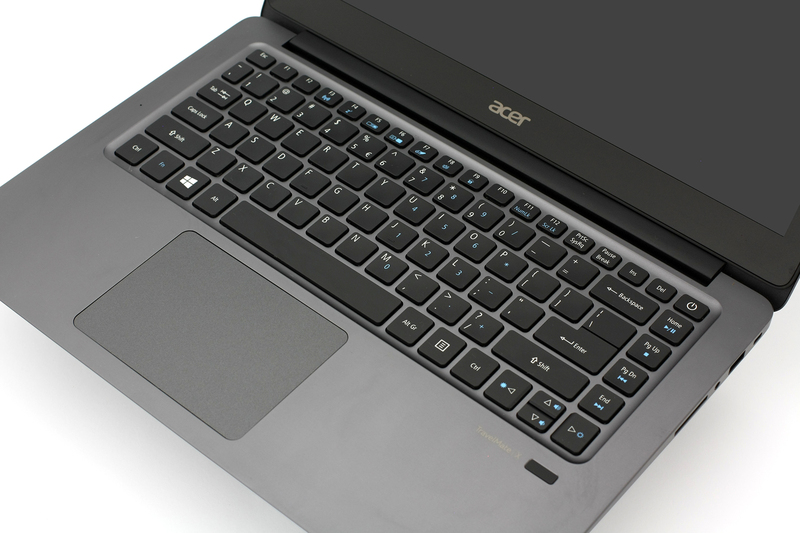 Another interesting thing about this laptop is the wide range of connectivity options including a USB-C 3.1 connector, which allows you to use Acer’s USB-C docking station. It gives you more connection options and a GTX 960M GPU, which will be more than enough for you to enjoy some gaming on the go without sacrificing mobility. We will try to go into detail regarding this feature and see how it will play out. 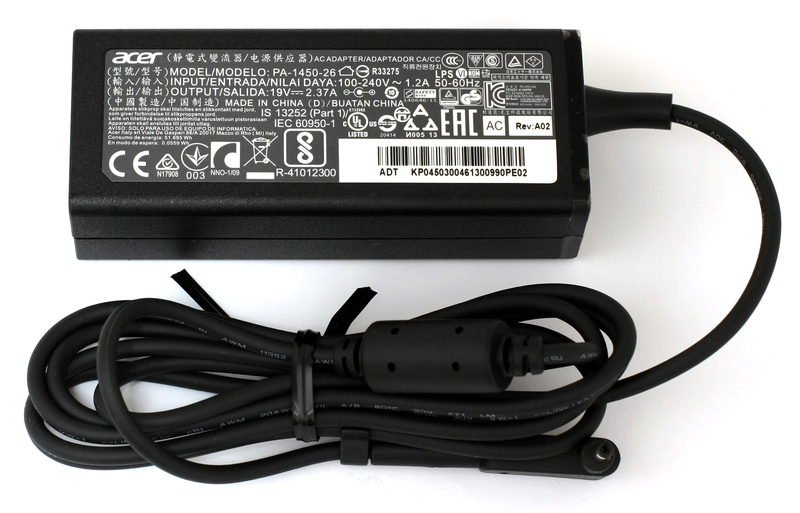 The retail package contains all the usual user manuals, DVD with drivers, AC adapter and power cord. The outer clamshell of the notebook looks strict, minimalistic and premium and the design concept continues on the inside but we cannot stop thinking about ASUS’ ZenBook laptops while looking at the interior. The keys, the keyboard tray, the anodized aluminum, the general layout – all of it looks just too familiar. 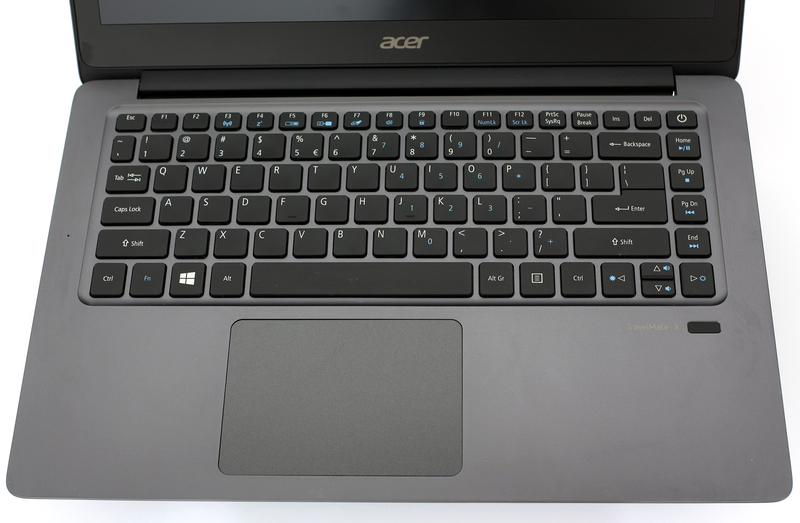 Nonetheless, Acer was able to implement something of its own – slightly concaved/curved keys on the keyboard for more comfortable typing experience. Let’s start with the lid, which is covered in dark gray anodized aluminum. Fingerprints stick easily on the surface but aren’t as visible while the stability of the material is rather questionable because it bends under small weight. Interestingly, though, this doesn’t cause distortions or ripples on the LCD screen on the other side of the lid. 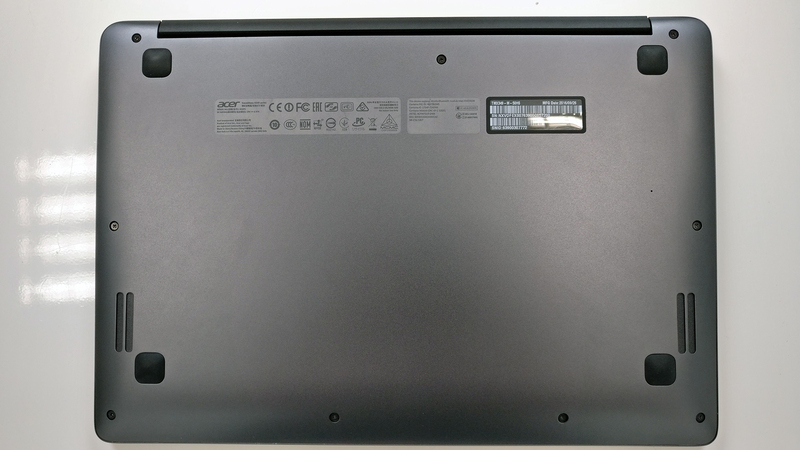 Speaking of the screen, when we opened the notebook we were pleasantly surprised by the relatively thin bezels. There’s one big hinge supporting the whole display and stretches almost across the whole base and there you will also find the main exhaust vent. Another similarity with the ASUS ZenBook UX303 for example. Moreover, the hinge is tight enough to eliminate excessive wobbling while typing on unstable surface but loose enough to allow opening the machine with just one hand. It’s also the only plastic element on the chassis and to be honest, it doesn’t feel very rigid. And as for the bottom plate, it’s again made of thin aluminum sheet featuring two grill openings for the loudspeakers on the sides. The ultrabook’s portability properties are backed up with a pretty thin profile of just 18 mm at its thickest point but doesn’t fail to deliver the usual set of ports you will find on a 14-inch form factor. Also, the port distribution is excellent without overcrowding either of the sides. The left side adopts the DC charging port, HDMI, USB 3.0 and USB-C 3.1 connector while the right side houses the SD card reader, 3.5 mm audio jack and USB 3.0. What’s left is the interior. It continues the same simplistic design concept with little distractions. The palm rest area is big and houses a huge touchpad for improved usability. It’s generally good with silky-smooth surface, light mouse clicks, and accurate gesture control. No wobbling occurred while working on it. The keyboard left us with the same impression – comfortable, stable and clicky. 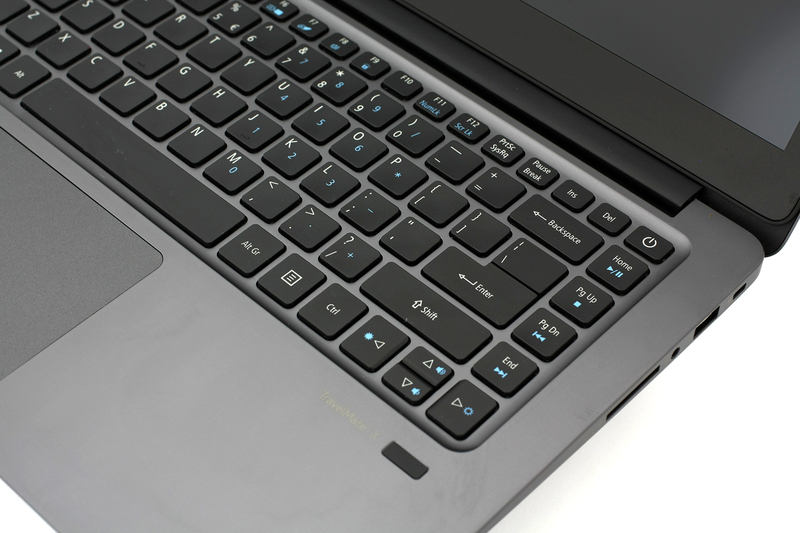 We have decent key spacing, travel and slightly curved buttons aiding with the overall usability. You won’t see any difference between this keyboard and a standard 15-inch one, except for the missing Numpad area. What’s interesting, though, is that Acer added and an extra column of keys – Home, Pg Up, Pg Dn and End keys also serving as media player controls. We would have appreciated a different key placement regarding screen brightness, volume and media controls. We assume these keys will be more frequently used and should have been placed near the Fn key so you can operate with one hand. But this is actually a minor drawback. Kudos to the elegant implementation of the fingerprint scanner located next to the TravelMate X sign on the right side. 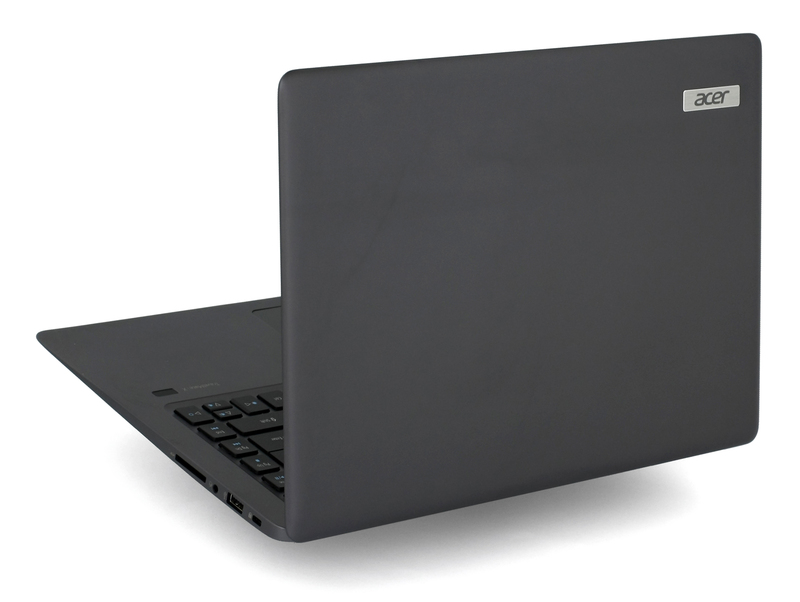 Weighing just 1.53 kg, the TravelMate X349 is one of the finest all-aluminum ultrabooks we’ve tested so far. The pricing is going to be crucial because there are a good number of competitors in this price range with similar design, features, and hardware. To stand out from the rest, Acer must keep its aggressive pricing strategy to make its ultra portable TravelMate X lineup worthy of its name. Opening the machine is really easy task. You just have to remove all the screws around the corners and pry up the plate with a plastic tool so you won’t scratch the surface. 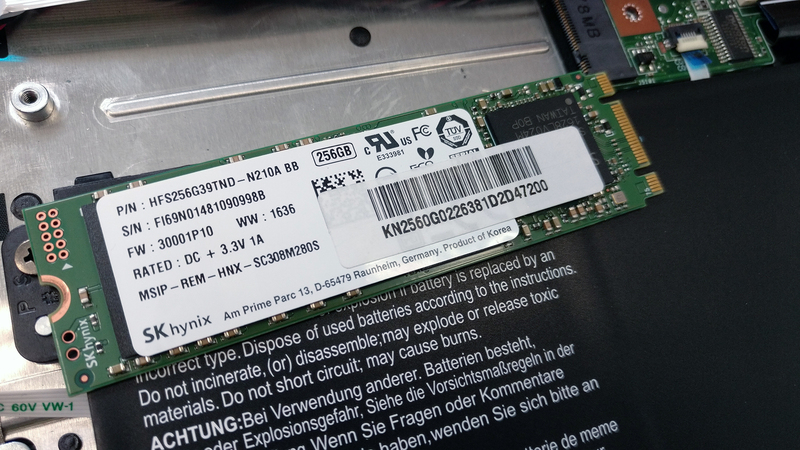 The notebook uses a 2280 M.2 SSD stick for storage and the unit ships with an SK Hynix SATA-enabled drive. However, you can upgrade it with an M.2 PCIe NVMe SSD as the motherboard seems to support it. 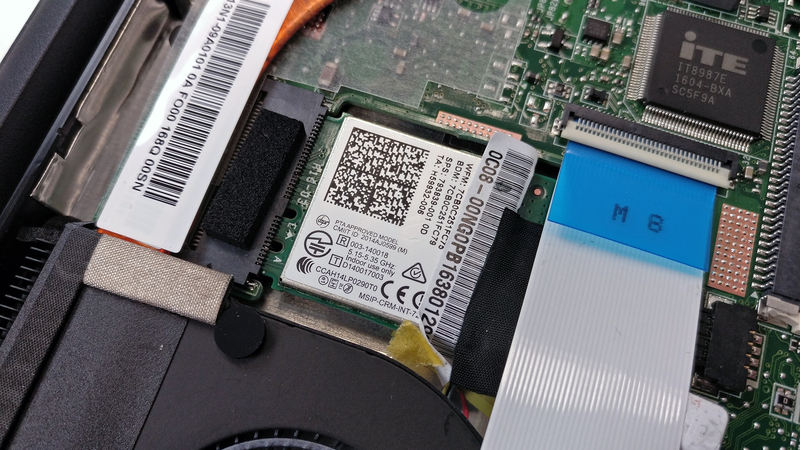 One of the main drawbacks of the device is the soldered RAM that can’t be upgraded and even the mid-range Core i5-6200U-equipped model ships with just 4GB of DDR4 RAM. The Wi-Fi card is easily accessible and it’s right next to the cooling fans. 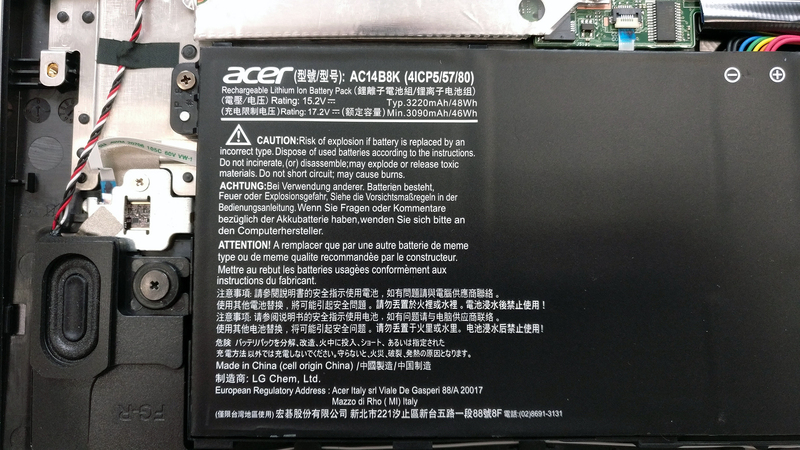 We see some empty space around the battery and we would have appreciated a slightly bigger unit but given the excellent battery results we got, there’s not much room for complaints. The 48Wh unit does its job pretty well. The cooling system seems a bit of an overkill with those two relatively big fans but, hey, it’s better to run things cooler than keeping the internals hot. 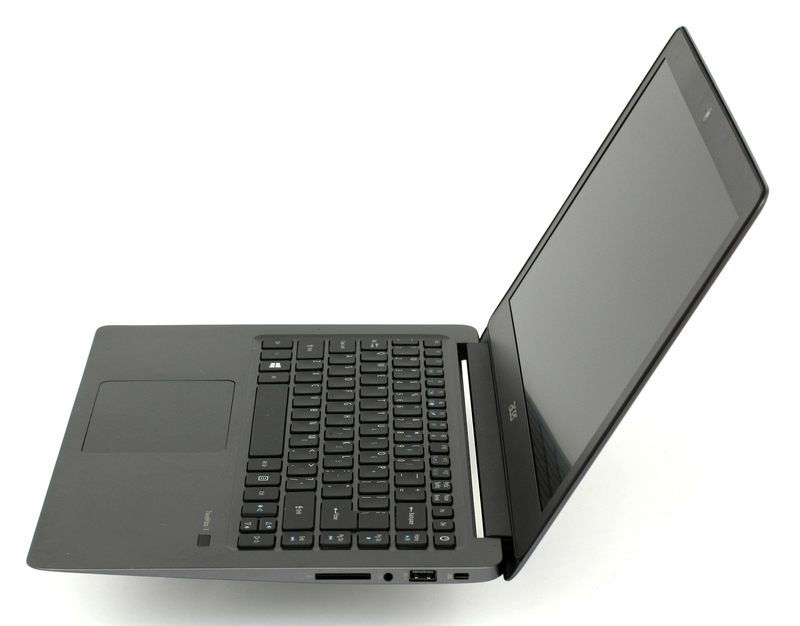 The notebook features a Full HD (1920×1080) IPS display with model number B140HAN02.1 manufactured by AU Optronics. The diagonal is 14 inches so the pixel density is 157 ppi and the pixel pitch is 0.161 x 0.161 mm. It can be considered as “Retina” when viewed from a distance equal or greater than 56 cm. The display’s colors don’t shift and offer good viewing experience from a 45-degree angle. We find the display’s maximum brightness a bit low – 234 cd/m2 in the middle and 224 cd/m2 as average with just 13% deviation. 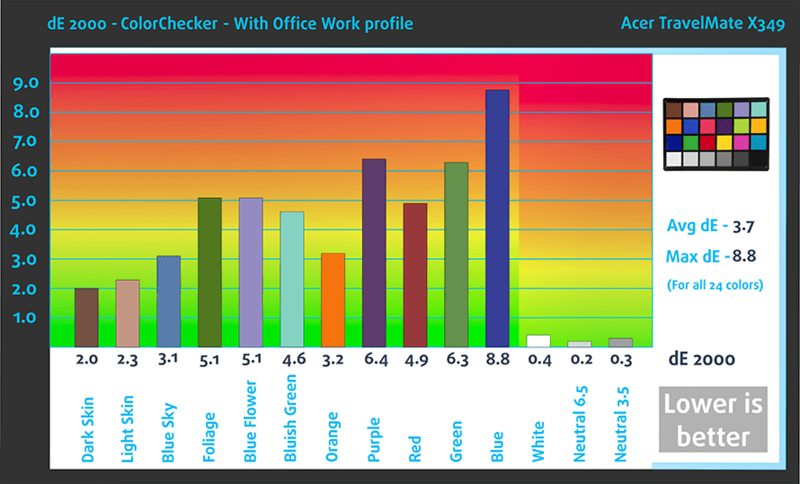 Color temperature, on the other hand, is pretty close to the optimal 6500K – 6730K. The contrast ratio is also pretty high – 1240:1 before and 1100:1 after calibration. The maximum color deviation of dE2000 is 3.4 in the upper-middle part of the screen but it’s still lower than 4.0, which is an unwanted value. 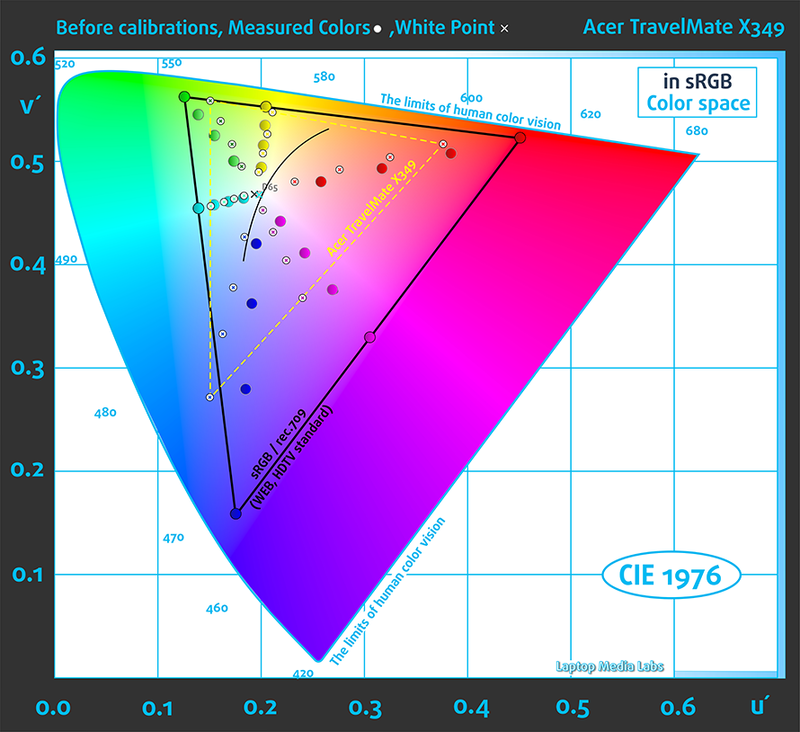 If you look at the yellow dotted triangle, you will see that the display covers just 50% of the sRGB color space, which isn’t enough for a good multimedia experience – half of the colors will be missing when reproduced. We recorded Fall Time + Rise Time = 23 ms. That’s surprisingly good result for an IPS panel. So in this case, the notebook’s screen doesn’t use PWM for regulating brightness levels so it can be considered as “user-friendly” and will not put unnecessary strain on your eyes. It really depends on what you are looking for but most of the user base, which would be businessmen, will be absolutely happy with the presented image quality. It’s a matte, high-contrast IPS panel with good viewing angles and close to optimal color temperature but somehow narrow sRGB coverage and slightly inaccurate color reproduction. Also, the screen’s maximum brightness might not be sufficient for outdoor use. But as we said earlier, the panel will be perfectly fine for most users doing general web browsing, office work and will satisfy your needs for multimedia on the go. It sure is a breath of fresh air in the lower and mid-range segment of the market. 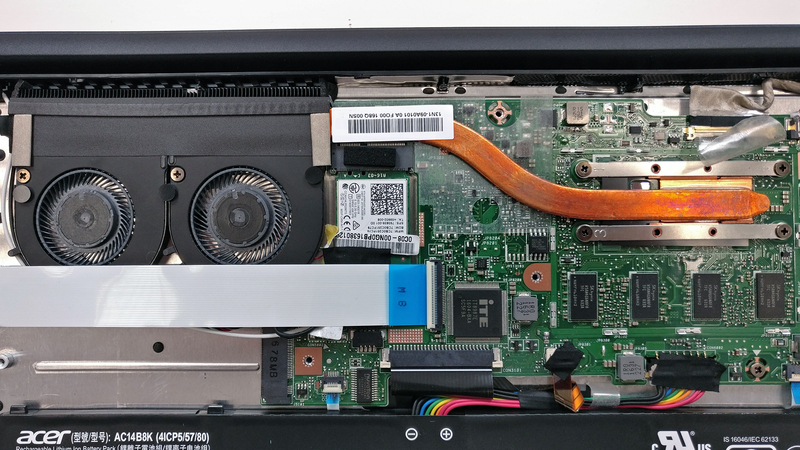 The X349-M will struggle to compete only against higher-priced models where the Core i7-6500U configuration stands. And finally, it’s really important to mention that the display doesn’t use PWM at all and this is really important because as a business laptop, you are ought to spend a lot of hours in front of the screen. So keeping your eyes safe is a top priority. The stereo loudspeakers provide good sound quality throughout all frequencies and the maximum allowed volume is decent as well. The specs provided below may differ from the final unit and configurations may varry depending on your region. The testing unit came with pre-installed Windows 10 (64-bit) and we used it for our testing. 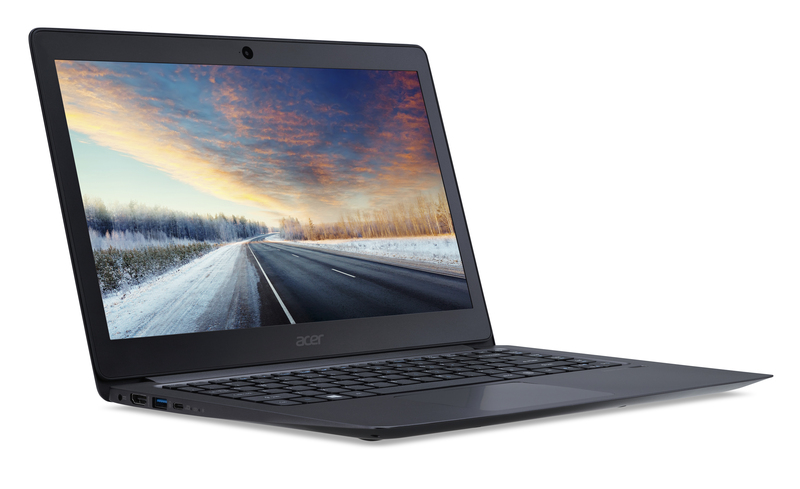 However, if you wish to perform a clean install of the OS, we suggest downloading the latest drivers from Acer’s official support page when the notebook hits the market. The battery on this thing is truly amazing. It comes as close second behind the ASUS ZenBook UX303 in terms of battery life while sporting roughly the same hardware – Core i7-6500U and a 14-inch IPS display supported by a 48.9Wh unit. The battery runtimes even beat some considerably more expensive notebooks along with some 12-inch and 13-inch devices with Core m processors, which by default should provide longer battery life. Anyway, all tests were run under the same conditions as always – Wi-Fi turned on, Windows battery saving feature turned on and screen brightness set to 120 cd/m2. More than an excellent result – 619 minutes (10 hours and 19 minutes). Much lower score but still comes on top of most devices – 441 minutes (7 hours and 21 minutes). This test got the most of the battery since it’s the most demanding one – 223 (3 hours and 43 minutes). Fritz is a chess benchmark that tests the computing capabilities of the CPU with various chess moves. 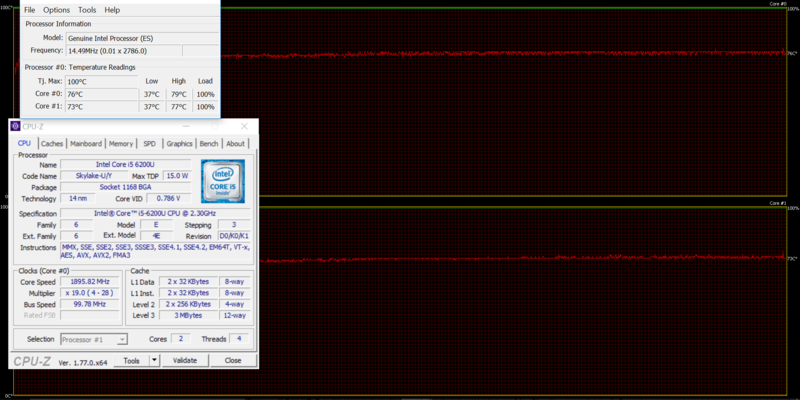 The Intel Core i7-6500U reached 6.124 million moves per second. By comparison, one of the most powerful PCs, Deep(er) Blue, was able to squeeze out 200 million moves per second. In 1997 Deep(er) Blue even beat the famous Garry Kasparov with 3.5 to 2.5. This test doesn’t really translate into real-life use because the general user won’t be able to reach 100% CPU and 100% GPU load for such long periods of time but it’s still a good way to determine the reliability of the system as a whole. We started off with 100% CPU load for an hour. 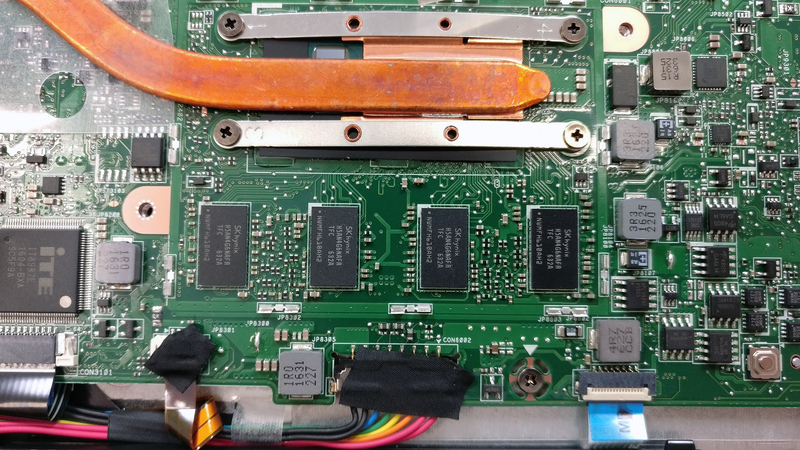 At first, the system was able to utilize the full potential of the chip reaching 2.8 GHz but then declined to 2.7 GHz, which is still in the Turbo Boost range. Also, the temperature of the CPU was pretty low and you can hardly hear the fans spinning. Very silent cooling solution we have there. After we switched on the GPU stress test as well, the chip’s temperatures rose and the CPU started throttling to give enough headroom for the GPU to perform. Everything went smooth throughout the test. Even the surface temperatures were pretty low as you can see on the heat map below. Acer has finally introduced ultra-portables under the TravelMate branding especially for business and we can honestly say it’s a step in the right direction. The TravelMate X349 is going to be affordable, portable, durable and with a sleek all-aluminum design delivering excellent input devices along the way. It’s also pairable with Acer’s USB-C dock that expands the port range and GPU performance with a GTX 960M on board suitable for some light gaming on the go. It’s really hard not to recommend this device since it has little drawbacks that the general business user won’t mind. We mean the hardware configurations include only Skylake processors despite the fact that Kaby Lake chips are already hitting the end consumer next month. But our best guess is that the notebook has been planned for a release months before Intel even announced the new Kaby Lake generation. It’s likely that the refresh of the TravelMate X3 series will come in the following months. But even without the Kaby Lake on board, the X349 shows excellent performance in all other areas – battery life, screen quality, and cooling. And all of this comes without the extra bulk on the price. In fact, the low-end model with Core i3-6100U and the mid-range variant with Core i5-6200U come at an exceptionally low price and will most likely appeal to most users. 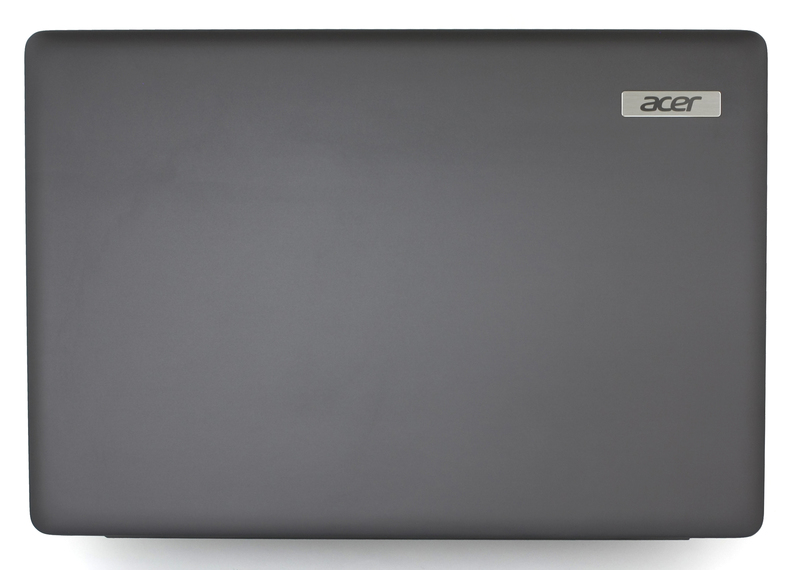 It’s good to see that Acer has kept its aggressive pricing for its TravelMate series. We only have concerns about the higher-end model with Core i7-6500U because it will have to compete against other well-known models like the ASUS ZenBook Ux303, which sports a more powerful GPU and better screen but still beats the hell out of the bulky Dell Inspiron 7359.